Toad Circuit is the first race track in the Mushroom Cup of Mario Kart 7. It takes place at a basic circuit where giant balloons of various Toads are seen floating throughout it. The award ceremony also takes place on the course at the end of every cup. Mario, Donkey Kong, and Peach racing along Toad Circuit. The course is a simple circuit with few obstacles, as it is the first course in the game and is comparable to Luigi Circuit of previous installments. There are a couple of long boost turns along the track and a couple of boost ramps which allow for the use of gliders, plus a bridge that the player can drive under or hang glide off a ramp and over the bridge and the ramp rises and closes from the ground up for usage after 40 seconds (although if they fly into the perpendicular track, it is considered out-of-bounds), as well as having a tunnel to drive through. 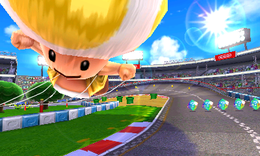 Giant mushrooms are seen through out the track in different sizes and three large balloons of Toads (red, blue, and yellow) are floating along the track as well. Banners of Toad himself can be seen throughout the course with the accompanying Mario Kart logo. There is a big turn, then there is a ramp, where the player can use their glider. Then there is a tunnel, two more turns and then a big curve where lots of coins can be collected before crossing the finish line to start the next lap. Near the big curve there is a ramp where the player needs a Mushroom to cross. Also, after the ramp there is a dirt area with pipes that the player can cross by using a Mushroom. The player can also cut the first turn using three Mushrooms. There is an Item Box glitch in this track. The player can do this easily with any glider and the glider ramp must be activated. When the player starts to glide they must move to the right where the Item Box rows are, and pick one up. When the player does this, they will be in last place or near it for some seconds and when they leave the bridge they will be in the top places with a last place item. Toad at the starting line. Shy Guy, Bowser and a Mii driving past the first turn. Shy Guy driving around a bend while passing the Blue Toad Balloon. A female Mii driving past the Red Toad Balloon. Koopa Troopa, Yoshi, and Shy Guy celebrating during the award ceremony. This course can be heard when Donkey Kong is on his 3DS in Donkey Kong Country: Tropical Freeze, due to the cheering audience. This page was last edited on August 25, 2018, at 13:15.